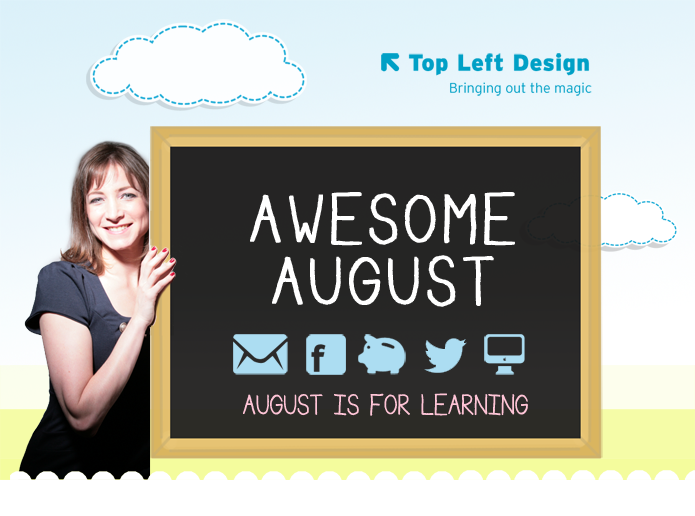 Top Left Design - Awesome August! Hope you are having an amazing August (and Summer) so far! I wanted to let you know about some events I am running in August and September, so you can whip out your diary and block out those dates. Or, if you use Outlook/iCal, that would work equally well. I have been learning a lot myself - and recently did the Prelude Group Growth Partner Programme and am now doing the Key Person of Influence programme too - watch this space. Our "Small But Perfectly Formed" workshops have been a hit. We originally had 3 dates which filled up very quickly, and now we have had a total of 17 so far. Now, it's time to do more "channel specific workshops". Workshops: "Extreme Twitter" and "Getting Started with Facebook and Blogging"
If you are still not sure how to get the most out of Twitter, Facebook or Blogging, then lucky you - I can help! I am running workshops at our office in Soho on 4 different dates, and if you click on the links below you can find out lots more about what is covered, what you will learn and why you should come. But one thing is for certain. You should come! You will learn lots! I promise! I am also speaking at this event this week - can you come? On Wednesday 14th (this week) there is a "Summer School" event hosted by Constant Contact and 1230 TWC and will held at The Westminster Hub. You can read about this event more on our blog - and you can even come along - registration is still open! It's a full day of learning and Speakers include Tamsin Fox-Davies, Jo James, Matt Perkins and Wendy Kerr. We will be talking about all aspects of running a small business and my specific talk is "9 ways to turn your website into a marketing machine"
Book yourself into this Summer School event this Wednesday - it's Free! I am teaming up with Alicia Cowan and Tamsin Fox-Davies for an event called "Your Three Part Formula to Online Marketing Success". It will be hosted by K&L Gates and will take place on the 30th of September. I will be in touch soon to give you more information, but be sure to put the date in your diary! The three of us (Tamsin, Alicia and I) will be meeting up in September in Ibiza (which I am sure you would agree shows a LOT of commitment) to plan the event - and there WILL be cupcakes. You haven't seen these yet, and we are excited to show you some of our latest site launches. Fiona Egerton-Warburton from Fine and Candy is passionate about the sweet things in life. Sweet tooth or not, Fine and Candy gets your taste buds tingling and we filled the site with mouth-watering pictures. Did you know that there are 12 different marshmallow flavours? Sweet. Avatar International is a global company that specialises in project management. Their focus lies on renewable energy, transportation and affordable housing. Avatar International offers partnerships with leading companies within these industries. Gillian Hepburn launched Quality Platform Solutions to offer consultancy services to platform providers, asset managers, and financial advisers. She can call upon more than 20 years of experience in financial services and has an incredible passion for making a difference. Focus PR is a fantastic PR agency which specialises in working with food and drink, luxury and lifestyle, and beauty and health sectors. This website includes all sorts of new cool code "under the hood" as well as a fantastic design! DG Law provides accurate, professional and innovative advice on legal issues of SMEs and larger companies alike. David Gordon is part of the team and has been on TV and radio to discuss key legal issues. Notice anything different recently with Top Left Design? send us an email with what you think it is!